Archaeologists have unearthed several 600-year-old bras that experts say could rewrite fashion history. While they’ll hardly send pulses racing by today’s standards, the lace-and-linen underpinnings predate the invention of the modern brassiere by hundreds of years. Found hidden under the floorboards of Lengberg Castle in Austria’s East Tyrol, along with some 2,700 textile remains and one completely preserved pair of (presumably male) linen underpants, the four intact and two fragmented specimens are believed to date to the 15th century, a hypothesis scientists later confirmed through carbon-dating. Unlike female undergarments, male underpants are frequently depicted in medieval imagery. Several schools of thought abound over who developed the first bra. Among the leading contenders are Herminie Cadolle, a corset-maker in late 18th century France, and Mary Phelps Jacob, a New York socialite who was awarded the U.S. patent in 1914. History has shown little indication that bras with clearly visible cups existed before the 19th century. While medieval-written sources sometimes mentioned “bags of the breasts,” “shirts with bags,” or “breast bands,” history has shown little indication that bras with clearly visible cups existed before the 19th century, according to Beatrix Nutz, an archaeologist with the University of Innsbruck who made the find. “My first thought was what probably anybody would have thought, ‘That´s impossible, there aren´t such things as bras in the 15th century,'” Nutz tells Ecouterre. 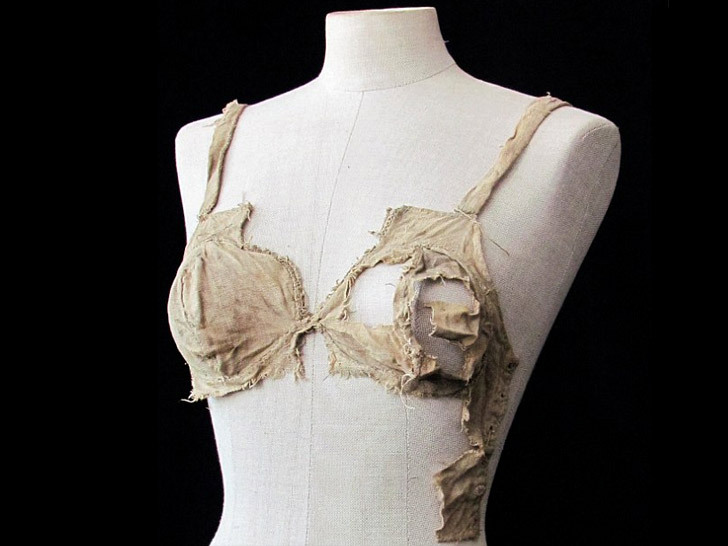 Archaeologists have unearthed several 600-year-old bras that experts say could rewrite fashion history. While they'll hardly send pulses racing by today's standards, the lace-and-linen underpinnings predate the invention of the modern brassiere by hundreds of years. Found hidden under the floorboards of Lengberg Castle in Austria's East Tyrol, along with some 2,700 textile remains and one completely preserved pair of (presumably male) linen underpants, the four intact and two fragmented specimens are believed to date to the 15th century, a hypothesis scientists later confirmed through carbon-dating.